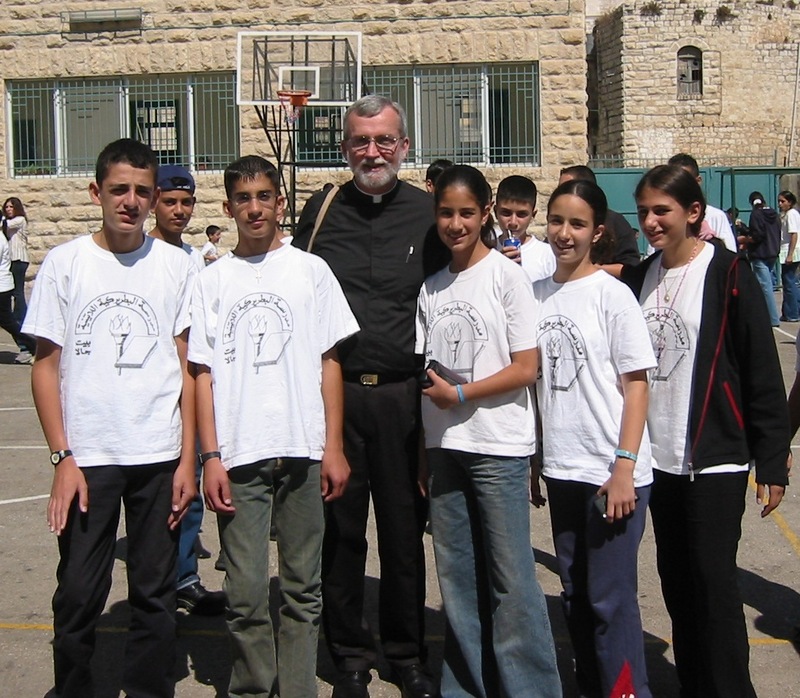 On this day in 2003, October 4, I met Issa, Tamer, Tamara, Ranim and Mary at their Latin Patriarchate School in Beit Jala, West Bank, Palestine. It was a Saturday morning. It was a blessed event for me! Only the official “voting” member states had the right to fly their flag in front of the United Nations. But the General Assembly just a few weeks ago voted overwhelmingly to allow the Palestinians and the Vatican, the only two nonmember “observer” states, to fly their flags. The flag of the Holy See, the official “state” name of the Vatican, was raised without ceremony last Friday, the day on which Pope Francis addressed the United Nations. It was flying today in its permanent place with all the other flags of the nations. 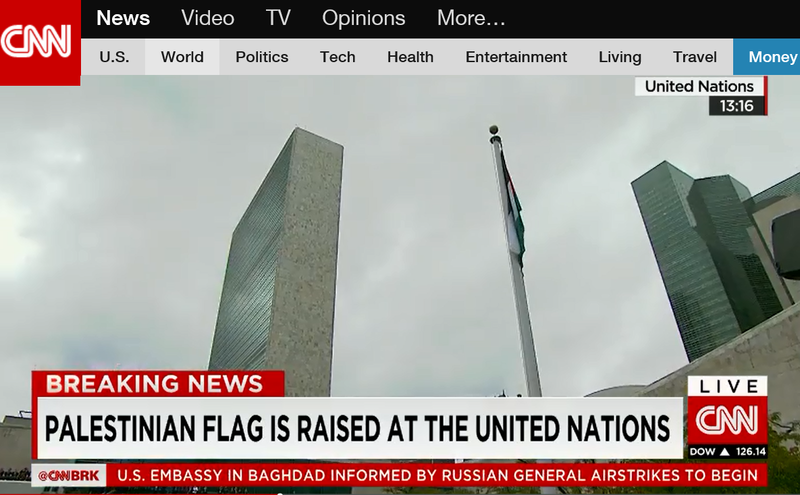 Today the Palestinian flag was raised at the United Nations at 1:36 p.m. in a ceremonial garden. At the ceremony Mahmoud Abbas, the Palestinian President, said that this day, September 30, will be known every year as the day of the Palestinian flag. The banner of breaking news at the bottom of the screen was screaming for attention at the same minute. 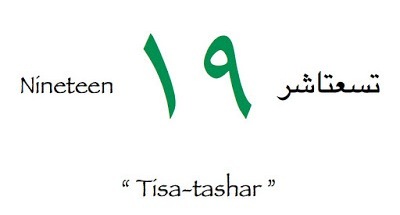 I wish I were there with you in Cremisan Valley. I wish I were there with you to prayerfully protest the taking of your land. I wish I were there with you, as the Israeli government under the protection of the Israeli Defense Forces starts again to uproot your olive trees, to clear the way for the separation wall that they prepare to build on your land. 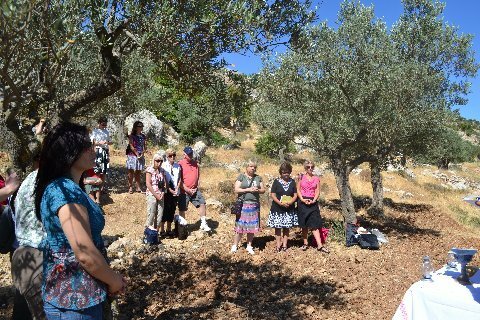 I wish I were there to genuflect with you and your priests before the altar, decorated with new olive trees in front of it and Israeli soldiers behind it; before the altar, on which rests that blue ceramic chalice that was the gift of our parish and our teachers to you, when we celebrated Mass with you in that same valley. 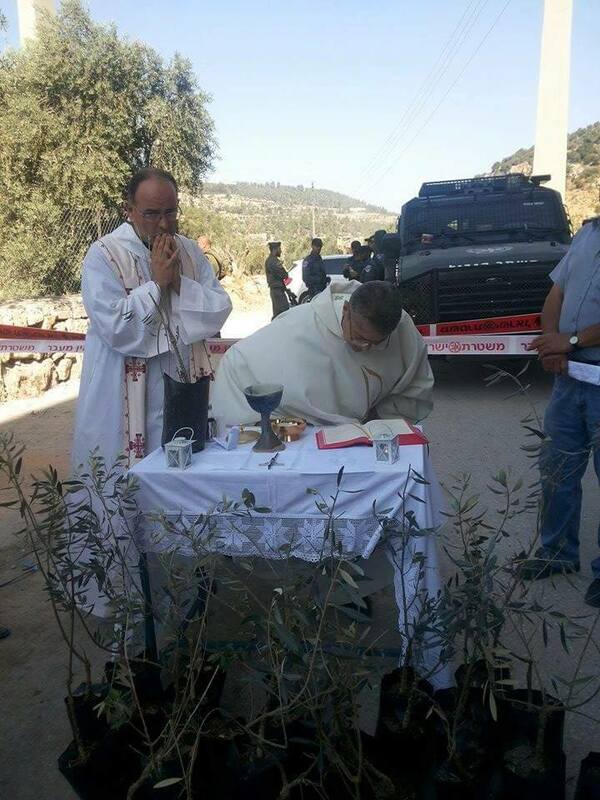 I wish I were there to stand beside your Catholic parish priest as he stands in front of – and stands up to – the Israeli soldiers. With these words we pray together for those who are in prison all over the world, those easily forgotten. We pray especially for the political prisoners of Palestine and Israel. We pray for the sick among them and those who cannot handle the hardship of a prison cell, for the children and women who are mistreated behind bars. We also remember those left behind, the families who are bereaved as their beloved ones are sent to prison. 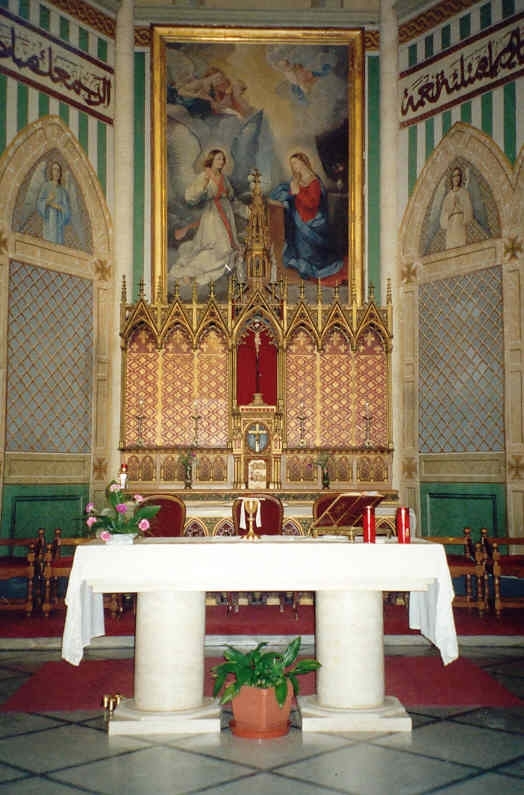 We pray for inner transformation for those who committed crimes, and in need of conversion. We pray for hearts and minds that are haunted by hatred and fear, that we will soon find peace and reconciliation in souls and in the societies. This region aches with so much troubles of the body and soul, both presently and in history. In Palestine and Israel today many lack freedom and too many are behind bars. For too long injustice, violence and fear have shaped this region. We pray and ask for human treatment and justice for all, as we are all children of God. At last we pray for a just peace settlement and reconciliation, a peace where there will be no more political prisoners behind bars and where harmony will prevail in the hearts of all the peoples of this region. We pray for God’s mercy, for freedom for those in shackles and for peace in our time. It’s time for Palestine. It’s time for Palestinians and Israelis to share a just peace. It’s time to respect human lives in the land called holy. It’s time for healing to begin in wounded souls. It’s time to end more than 60 years of conflict, oppression and fear. It’s time for freedom from occupation. It’s time for equal rights. It’s time to stop discrimination, segregation and restrictions on movement. It’s time for those who put up walls and fences to build them on their own property. It’s time to stop bulldozing one community’s homes and building homes for the other community on land that is not theirs. It’s time to do away with double standards. It’s time for Israeli citizens to have security and secure borders agreed with their neighbours. It’s time for the international community to implement more than 60 years of United Nations resolutions. It’s time for Israel’s government to complete the bargain offered in the Arab Peace Initiative. It’s time for those who represent the Palestinian people to all be involved in making peace. It’s time for people who have been refugees for more than 60 years to regain their rights and a permanent home. It’s time to assist settlers in the Occupied Palestinian Territories to make their home in Israel. It’s time for self-determination. 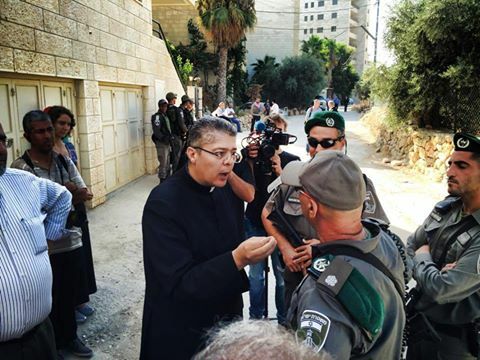 It’s time for foreigners to visit Bethlehem and other towns imprisoned by the wall. 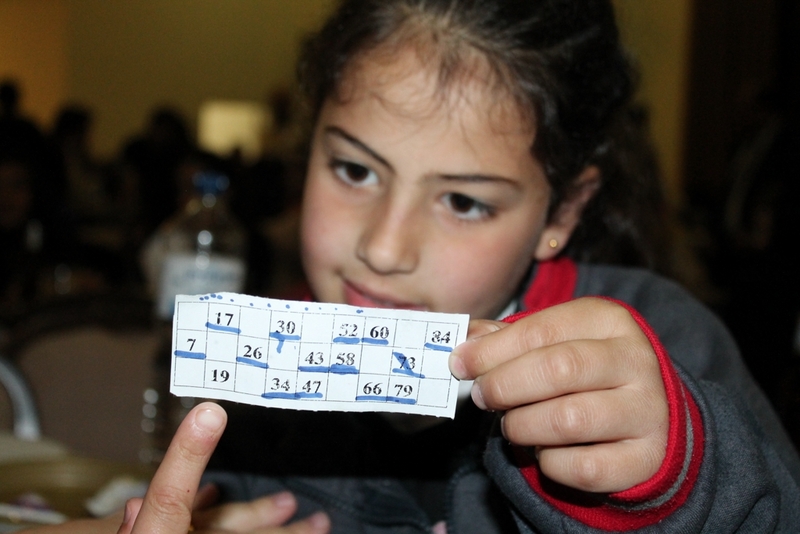 It’s time to see settlements in their comfort and refugee camps in their despair. It’s time for people living more than 40 years under occupation to feel new solidarity from a watching world. It’s time to name the shame of collective punishment and to end it in all its forms. It’s time to be revolted by violence against civilians and for civilians on both sides to be safe. It’s time for both sides to release their prisoners and give those justly accused a fair trial. It’s time to reunite the people of Gaza, the West Bank and East Jerusalem. It’s time for all parties to obey international humanitarian and human rights law. It’s time to share Jerusalem as the capital of two nations and a city holy to three religions. It’s time for Muslim, Jewish and Christian communities to be free to visit their holy sites. 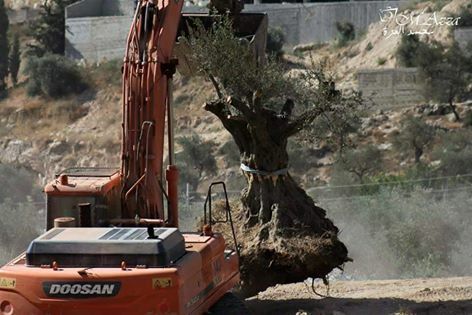 It’s time in Palestine as in Israel for olive trees to flourish and grow old. It’s time to honour all who have suffered, Palestinians and Israelis. It’s time to learn from past wrongs. It’s time to understand pent-up anger and begin to set things right. It’s time for those with blood on their hands to acknowledge what they have done. It’s time to seek forgiveness between communities and to repair a broken land together. It’s time to move forward as human beings who are all made in the image of God. All who are able to speak truth to power must speak it. All who would break the silence surrounding injustice must break it. All who have something to give for peace must give it. For Palestine, for Israel and for a troubled world, it’s time for peace. Father Elias Tabban, parish priest of Jaffa of Nazareth, Israel, visited with us in October 2013. 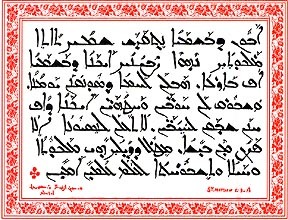 Father prays the Our Father, the Lord’s Prayer, in Aramaic, the language in which Jesus prayed and taught his disciples to pray. 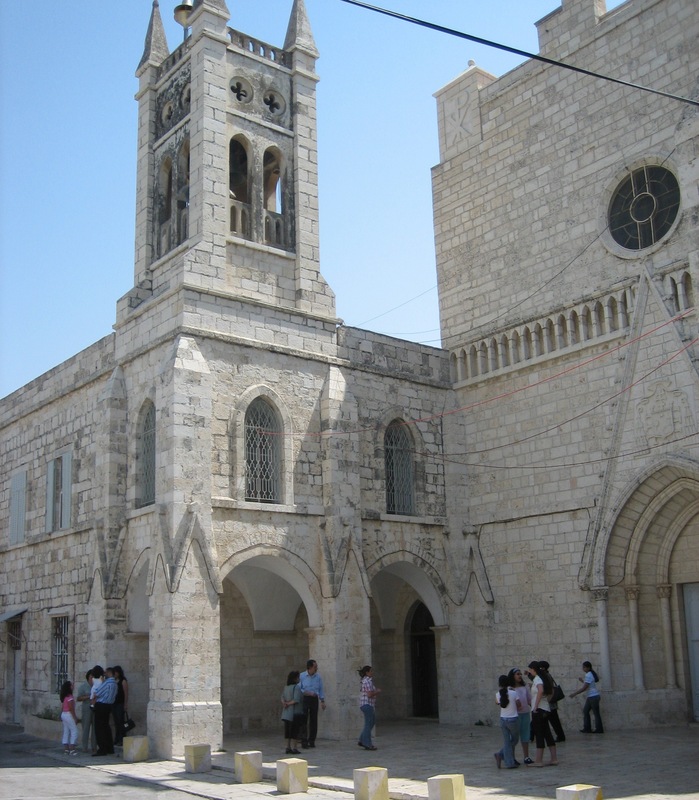 The Catholic parish in Beit Jala (Bethlehem) is the Church of the Annunciation. Today, March 25, the Solemnity of the Annunciation, is the parish’s patronal feast day. Adding to the celebration is the fact that it is the birthday of their pastor, Father Ibrahim. A big day it was this year. The school children had a day off from classes. The teachers had a retreat day with Bishop Shomali. There was a special Mass. There was a parish dinner. 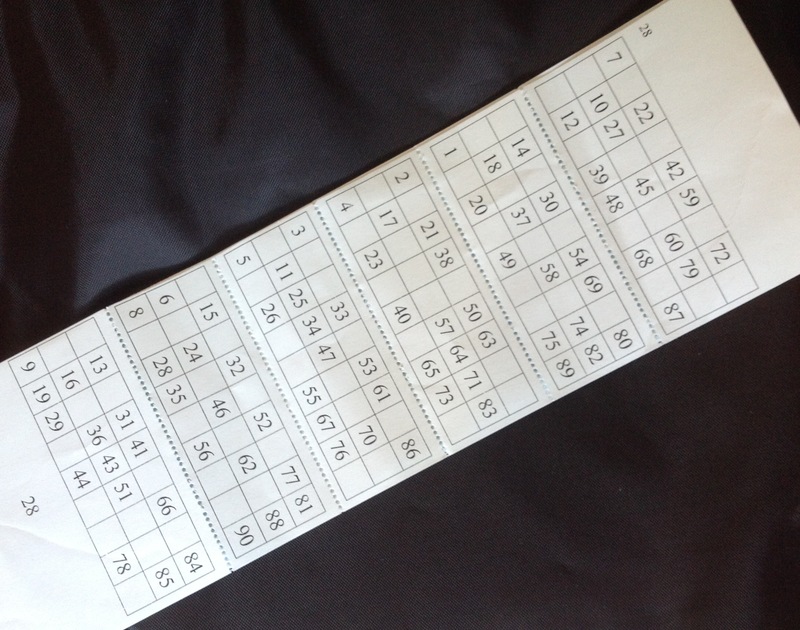 And there was tembola – bingo! It is said that, when Gabriel appeared to Mary in Nazareth and asked Mary if she were willing to be the virgin mother of God’s own Son, there was a moment of suspense between the question and the answer – and the angels in heaven held their breath! At tembola (bingo) after dinner today in Beit Jala at the Church of the Annunciation another angel of God, Jouelle, held her breath. She was waiting for number “19” to be called. She would have had a “full house” (a cover all). But someone else called “khallas” (stop) before her last number was called. Jouelle, you did not win the prize at tembola. But I hope that seeing your picture on my blog helps you to feel better. 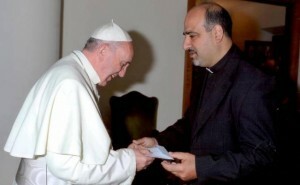 VATICAN – In an audience with Pope Francis at the Vatican, Father Ibrahim Shomali, parish priest of Beit Jala, delivered a message from the people of the city to the Holy Father relating the current suffering of Christian families in the town of Beit Jala. Fr. Shomali emphasized to the Holy Father the extent of the Israeli oppression regarding the people of Beit Jala, through its expropriation of private lands to open roads and build settlements, including the Wall of Separation, and, more recently, the seizure of lands belonging to the Convent of Cremisan. Fr. Shomali’s message focused on the fact that the “Palestinian people” strongly adhere to its national homeland and its fight to stay on it. However, the conservation of lands requires concrete measures to thwart any takeover attempt, and to enable the Palestinian people to live with dignity in a free State. 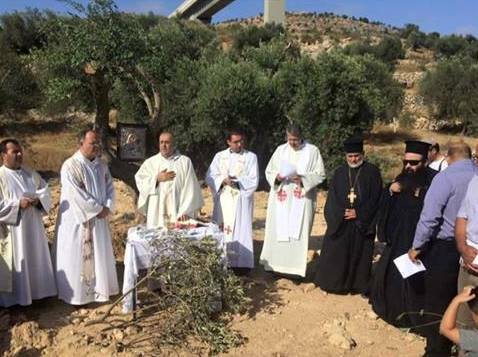 It is worth recalling here that an Israeli Court in Tel Aviv last April adopted a decision reaffirming the course of the Separation Wall, around Cremisan, especially between the Convents of the Salesian Fathers and the Salesian Sisters, as well as the annexation of private properties belonging to 58 Palestinian families of Beit Jala to the settlement of Gilo, south of Jerusalem. The Heads of the Catholics Churches in the Holy Land, at the time, called for the realignment of the course of the Wall, in accordance with internaitonal law, pointing out to the Israeli decision-makers that the seizure of lands in no way serves the cause of peace, nor does it bolster the position of the moderates who, in this objective, opt for non-violence.